Just as there are many ways to track time through the calendar year, there can be various methods for charting the lands of this remarkable continent. Nabhan and his colleagues have mapped North America—including Northwest Mexico and most of Canada—by identifying thirteen regional “food nations” distinguished by place-based foodways. Each food nation is named for an iconic dish, and anyone familiar with Mvskoke tastes will be gratified to learn that Mvskoke country, both before and after Removal, is encompassed by “Cornbread Nation.” Back east, this region borders “Chestnut Nation” and “Gumbo Nation” in the Mvskoke homeland; out west, this agricultural complex shares a boundary with “Bison Nation” running across the Muscogee (Creek) Nation. The RAFT collaborative has inventoried more than a thousand heirloom varieties and heritage breeds that are currently threatened, endangered, or functionally extinct. Nearly a hundred are profiled in the book, at least half of which were—or still are—indigenous staples. The ten plants and animals detailed in a chapter on Cornbread Nation are as colorfully named as they are appetizing: Yellow Hickory King Dent corn, Mulefoot hog, Southern Queen yam, Early Golden persimmon. But the most intriguing story here, from a Mvskoke perspective, is surely the so-called Chickasaw plum. The plot thickened during the Creek War, nearly two centuries ago, when frontier militia and their Cherokee allies massacred residents of the Hillabee villages near the Tallapoosa River on November 18, 1813. Having also chanced upon a patch of fruit trees, one settler returned home with a supply of native plum pits, which he cultivated in Knox County, Tennessee. Locals loved the new plum and took to calling it “General Jackson” and “Old Hickory,” commemorating the spoils of war. The looted fruit later made its way to Illinois, where it was propagated under the name “Chickasaw Chief,” and to Wisconsin, where it came to be known as the “Miner” plum, now the Chickasaw’s best-known cultivar. Writing in 1911, horticulturalist U. P. Hedrick described this species as “one of the most distinct of plums” and “the first of the native plums to be named,” of which there were already more than forty named cultivars. “The fruits are good in quality, attractive in appearance, comparatively curculio-proof [pest-resistant],” and “especially suited for culinary uses.” But industrial agriculture had little use for this native commodity, and over the past century P. angustifolia was nearly lost and forgotten. Recent discoveries near Horseshoe Bend on the Tallapoosa River, however, have shed new light on both the plum and its history. Finally, in 2004, botanists working at Horseshoe Bend National Military Park found six cross-compatible species of native Prunus—including P. angustifolia—near the site of Tohopeka village. It now seems clear that the original specimens taken from Hillabee, a few miles to the west, had been carefully cultivated by Mvskoke growers. Anyone who studies traditional ecological knowledge learns to appreciate the vitality of indigenous languages. There is ample evidence of participation with nature preserved in este-cate em opunvkv, the Mvskoke language. The months of the year are named for important moments in the annual round of subsistence: seasonal observations and activities related to agricultural production, but also times for gathering the fruit of undomesticated plants. An older way of life is signified by em vliketv that define Mvskoke kinship and by opvnkv performed at Mvskoke ceremonial grounds: various clans and dances mostly named for animals, many of which provided sustenance to our hunter-gatherer ancestors. Even the phrase este-cate em opunvkv, literally “red people, their talk,” uses sensory metaphors—visual and aural—to describe itself. Mvskoke words were planted on paper in the 1730s by Salzburger settlers living near the Savannah River. This written tongue grew sporadically in the old country, but Mvskoke literacy really blossomed after removal to Indian Territory, largely because general education was conducted in the Mvskoke language. “As a result of the missionary schools,” writes linguist Jack Martin, “many Creeks and Seminoles were literate by the end of the nineteenth century.” They wrote letters, laws, constitutions, newspaper articles, pamphlets, and other materials in the Mvskoke language, many of which have been archived at the University of Tulsa, the Oklahoma Historical Society, the University of Oklahoma, and the Gilcrease Museum. Written Mvskoke withered in the wake of Oklahoma statehood. The spoken word fell into disuse more gradually, but “by the 1970s the Creek language was in serious decline.” This prompted the recording and publication of various language materials—first by Mvskoke citizens, then by professional linguists. The latest, and perhaps most important, of these post-English resources was authored by Martin with the assistance of Margaret Mauldin and Juanita McGirt: A Grammar of Creek (Muskogee) offers the most comprehensive analysis of the language to date. Like many American Indian languages, Mvskoke is an action-oriented medium whose grammar revolves around verbs. “A great deal of information can be conveyed with a single word in Creek,” because the language has “a complex system of grades” in verb stems, which are further modified by a large number of prefixes and suffixes. Conjugating a Mvskoke verb is not for the faint of heart; the sample paradigms in Martin’s book run to 13 pages listing more than 350 forms of the stem wvnvy-, “tie.” European languages, on the other hand, are generally more noun-oriented and tend to frame reality as an assortment of objects. To put this more succinctly: English emphasizes the things being tied, whereas Mvskoke focuses attention on the act of tying. The practical significance of this distinction comes into view if we recall the history of Western environmental science. Like other modern disciplines, the scientific field of ecology has evolved considerably over the past century or so. It originated in an ancient tradition of Greek philosophy that regarded the natural world as static and stable, a worldview that was finally challenged by Charles Darwin. The naturalist forerunners of ecology concentrated on exploration and description, constructing elaborate taxonomies of plant and animal life. Early ecologists generally studied discrete entities: species, populations, habitats, communities. Only with the rise of a systems approach, which examines the movement of energy and nutrients through the various components of an ecosystem, has professional ecology developed an appreciation for complexity and interrelatedness comparable to that already intuited by indigenous peoples. This ancestral awareness has often manifested in languages that stress actions rather than objects, connections rather than separations. While modern Mvskokes have mostly adapted to consumer culture, a more viable means of participating with nature can still be found in the language of Mvskoke country. People of a certain age will remember Uncle Remus and his tales of Br’er Rabbit and other animal characters. Growing up in the sixties, I enjoyed listening to my parents read stories that had been popularized a generation earlier by Disney’s Song of the South, a feature-length musical combining live action with animation. The movie was based on the writings of Joel Chandler Harris, an Atlanta journalist who invented “Uncle Remus” in the 1870s as a narrative device for retelling the folklore he first heard while living on a Georgia plantation during the American Civil War. 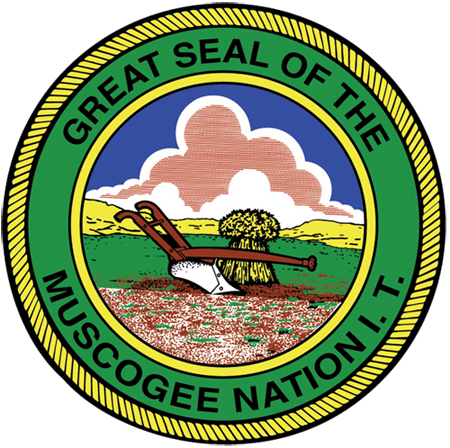 More importantly, Harris was familiar with the contemporary work of W. O. Tuggle, a lawyer working for the Muscogee (Creek) Nation who collected stories on the side during his visits to Indian Territory. Some of Harris’s published tales clearly follow the organization of Tuggle’s unpublished drafts, and Tuggle’s manuscript was also freely copied in the 1920s by southeastern anthropologist John R. Swanton. The most popular of the Uncle Remus storylines—and the one I remember best from my childhood—finds Br’er (Brother) Rabbit contending with a “tar-person,” a small figure made from pine tree pitch, which Harris calls “the Tar-Baby.” Having managed to get himself inextricably stuck to the tar-person, which was fashioned by Br’er Fox for just this purpose, Br’er Rabbit is in quite a fix. Of course, if Br’er Rabbit really is Mvskoke, he probably refers to his birthplace as kvco vlkat (“brier patch”) whenever he appears in Mvskoke country. Kvco is the Mvskoke word for “brier,” those thorny, prickly bushes that offer protection from predators for rabbits and other small animals. It’s also the name of the final month in cokv-walv Mvskoke. So why is Kvco-Hvse generally translated as “Blackberry Month”? In modern Mvskoke, kvco can refer to a brier or to a berry that grows on one. Two of the most common fruit-bearing briers are kvco-hvlkv, “dewberry,” and kvco-huerv, “blackberry.” The Mvskoke modifiers describe the growth habit of each plant: dewberries like hvlkv, “crawling” along the ground, while blackberries prefer huerv, “standing” more upright. A more precise name for “Blackberry Month” today might be Kvco-Huerv-Hvse. So while the modern translations “Brier Month” and “Berry Month” are generally accurate, since the blackberry is indeed a fruit-bearing brier, remembering Kvco-Hvse as “Blackberry Month” preserves an older, more precise usage of Mvskoke terminology. Think of it as a symbolic gesture, a small but significant way of honoring Mvskoke forebears who cared enough about this generous plant to name a month for it. And don’t take this lexical slippage as a bad omen. Change is the hallmark of any living language, just as trading stories means recreation for every vital cultural tradition. We may never determine the tribal pedigree of Br’er Rabbit—he is a liar, after all—but we can know for sure that he’s one of us, especially when we need the help of a brier patch. The calendar year in Mvskoke country winds down with a couple of months named for edible fruits: kē, “mulberry,” and kvco, “blackberry.” And like only one other month in cokv-walv Mvskoke (Hotvlē-Hvse, “Wind Month”), their traditional names include the word for “month” itself, presumably to avoid confusion between each month and its namesake. The remaining nine months bear distinctive names and thus don’t need to be specified as hvse. Kē is the Mvskoke word for “mulberry,” and it’s also the way you pronounce the letter “k” in the Mvskoke language, a semantic association that could serve as a handy teaching tool. An alphabet book designed for Mvskoke-speaking youngsters, for example, would undoubtedly use mulberries to illustrate the letter “k.” Am I the only one who wishes we had a children’s book titled “M is for Mvskoke”? Mulberries are an understory species typically found in mixed stands of deciduous forest. These small, shade-tolerant trees prefer moist soils and edge habitats, and today you can still find them sprouting around low-lying pastures and along the margins of fields. Both male and female mulberries flower in the spring, but only females produce berries; the fruit of red mulberry trees is known for its large size and strong, sweet flavor. European colonists were quick to assimilate this indigenous commodity. At Ebenezer, in the Georgia colony, Bartram found a village of German settlers where “the Town is laid out in large Squairs so that every family has ground sufficient to plant a Mulberry Orchard, a Garden, & a Cornfield.” Visiting a plantation near the South Carolina coast, he observed a large orchard of imported white mulberry (Morus alba), “some of which were grafted on stocks of the native Mulberry (Morus rubra); these trees were cultivated for the purpose of feeding silk-worms,” a commercialized insect wholly dependent on mulberry leaves. As was so often the case, immigrants saw profit where Indians had seen only provision. Kē was a staple food for Mvskokes in the old country, so they marked time with the help of kē-vpē blossoms. According to one account of Mvskoke origins, documented at Pine Arbor Tribal Town in North Florida, the beginning was an age of great confusion. All beings existed without a place: “It isn’t very pleasant to be nowhere. It’s like being lost, only worse.” Thanks to the efforts of Turtle, Duck, and many others, the world was made and ordered and “everything now had an appointed place.” Then “a great Ceremonial Square Ground” was established, where important traditions could be nurtured.